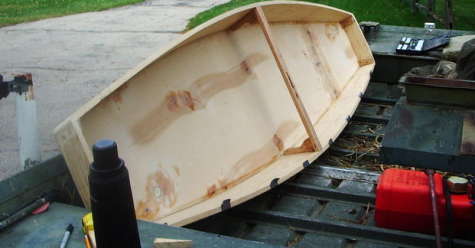 This design is for a small, protected-water "skiff", hopefully with some of the performance of the Upper Mississippi River Duck Skiff, but which is small enough and specifically designed to nest inside a flatboat "Mothership" for transport out into the marshes through open water. 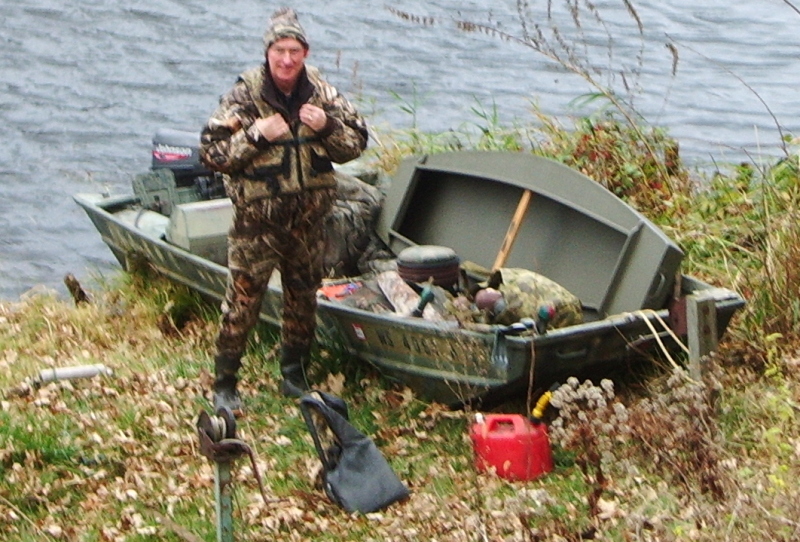 A skiff like this is used to move into extreme shallows where a larger boat cannot navigate or be easily concealed, for putting out decoys, and for retrieving downed birds. 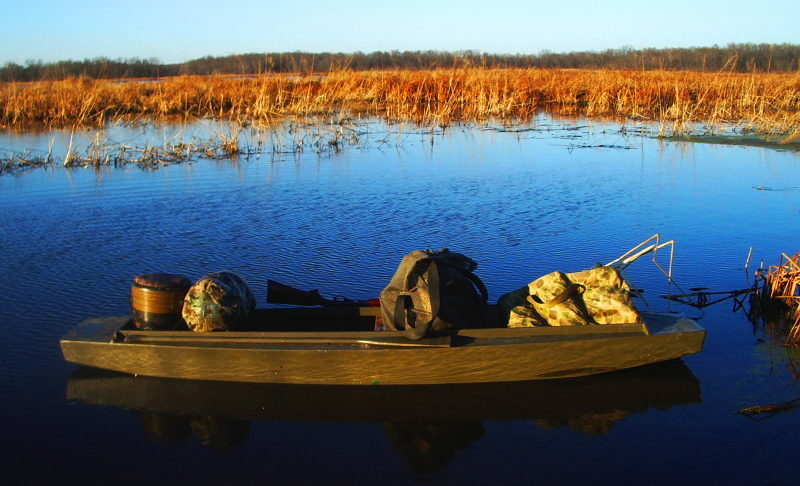 On occasion, it might be used to jump-shoot, paddling small streams and marsh edges, particularly for wood ducks early in the year. I used to tow these things, but have had WAY too many hairy experiences towing them in storms. This nesting idea is much safer. Note the lack of a center thwart in the flatboat, which makes this nesting idea workable. The cockpit of the skiff is usable storage while underway in the mothership - you can pile decoys and other gear in it - not wasted space! A 29-inch beam (at the bottom) made the displacement come out about right, and I felt that would be about right for stability (it was). Did not want more beam than needed, to keep weight down, and so it would not stick up too high when carried on its side in the mothership. The original idea was to match the flare of the skiff exactly to the flare of the flatboat, but I thought flatboat flare (varies from 32 degrees aft to 22.5 degrees forward was just too extreme for a practical skiff. 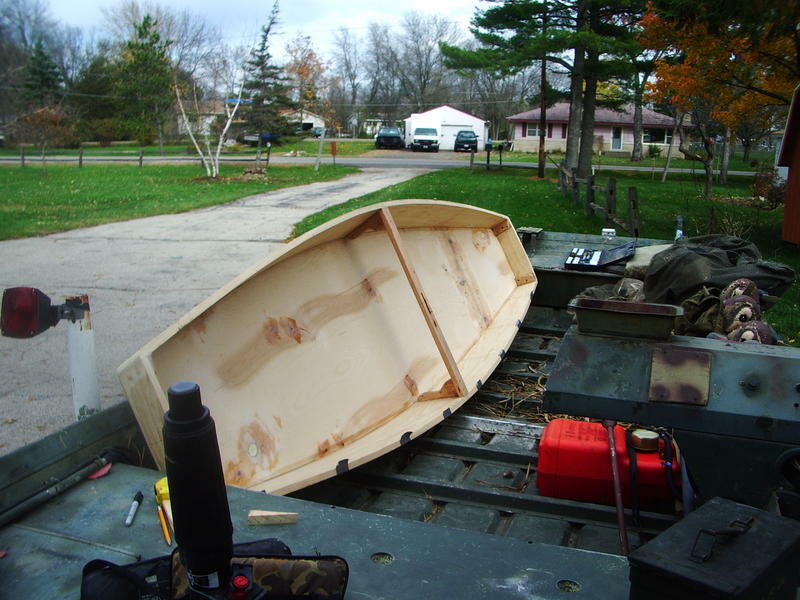 The skiff is built "instant boat style", ala Bolger/Payson, using the developed panels projected by Carene 2008. There is one frame, centered in this symmetrical boat. 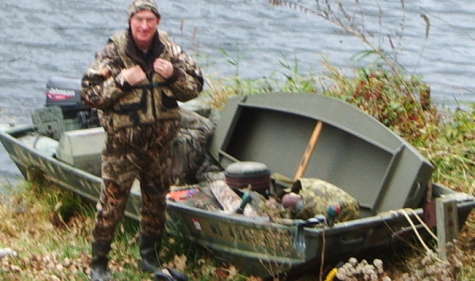 These boats are paddled kneeling, for ease of shooting (much harder to shoot from a sitting position). Also there is LOTS of getting in and out in this kind of work, going over beaver dams and shallow spots. You wedge in between the coaming with your thighs for stability, and against the thwart. 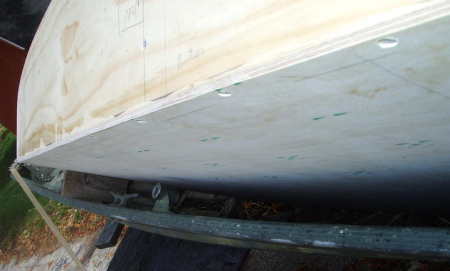 A short, rockered boat like this will just go round in circles with a single paddle, unless you give it ample keel, which I did, clear out to the ends (you can see it poking out here ). 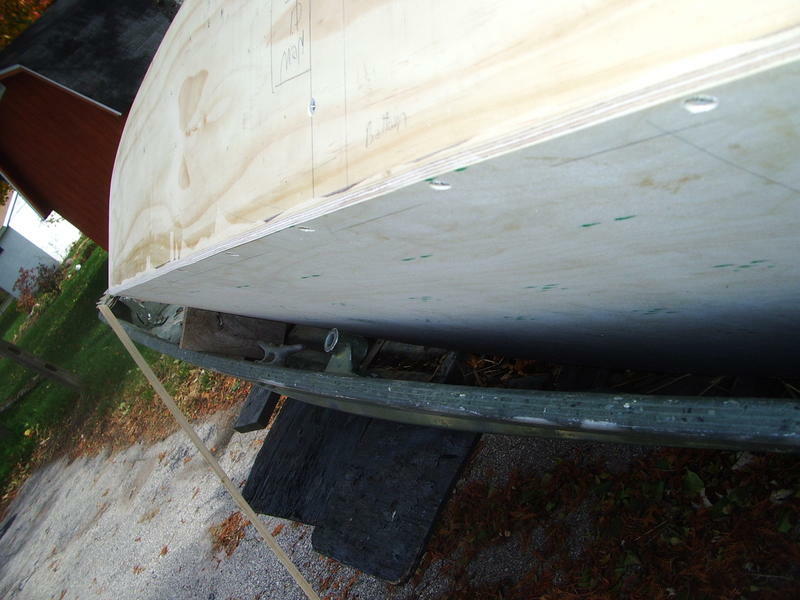 The full-ish keel adds to the odd look of the boat, but it works nicely. I may actually plane a little off the ends - it has plenty. Double (kayak) paddles are NOT for this type of boat: The wagging of the high paddle blade in the air will scare ducks for miles around, they are hard to store in a short boat, and do not work as well when using the paddle to pole over mud, which we do a LOT. I built a special thick-bladed paddle for this work, thick and flat on the bottom, which does not sink down in mud and stick there like a conventional thin paddle. Next steps to trick it out a little further"